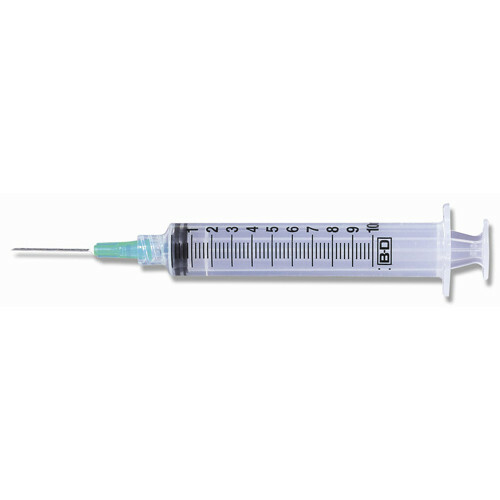 The BD 10 mL Syringe with PrecisionGlide Needle & Luer-Lock Tip is a disposable syringe, which features a clear barrel and an easy to read scale. The 1-Inch precision-glide needle is stainless steel and is available with a 20, 21, or 22 gauge needle. The Becton Dickinson 10 mL Syringe, features the patented BD Luer-Lock tip. This threaded, leak-free connection between needles, IV ports and other devices, delivers a secure lock-fitting, preventing potential needle disengagement and can be fixed with a conventional or safety needle. Is each syringe wrapped individually? We use them for gardening.